Put a steakhouse-style spin on your next cold pasta salad with toasted walnuts and tangy crumbled blue cheese. Cook pasta as directed on package, omitting salt. Drain. 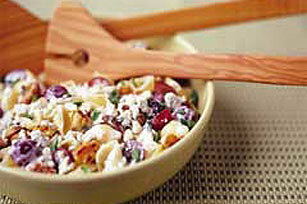 Toss pasta, grapes and onions in large bowl. Mix dressing and juice until blended. Add to pasta mixture with nuts and cheese; toss to evenly coat. Prepare using MIRACLE WHIP Light Dressing.